Artichokes are a real super food and a delicious one at that. Follow my step-by-step guide & video and choose between steaming or boiling them, and then serve them my favorite way – with a highly addictive Whipped Lemon Butter. And for a bonus: all the reasons they’re so good for you & a guide to how to eat them. Have you tried artichokes? I was lucky enough to have them a lot as a kid, and as an adult I make them as often as I can get away with as soon as artichoke season hits (Wondering when that is? Read on!). To me they’ve always been this indulgent late-night snack, and I never knew just how good they are for you. But now that I know – you bet I’ll be making them even more often! What do artichokes taste like? OK so you know how people have tried describing umami flavor and there just isn’t a good description of it? Yeah, that’s artichokes. They just taste… good. Not too much, but really good. And that taste? Yeah, you guessed it – it’s umami. Artichokes are actually one of the non-animal products that are richest in umami flavor. And to me, probably the one where the umami flavor is the purest. 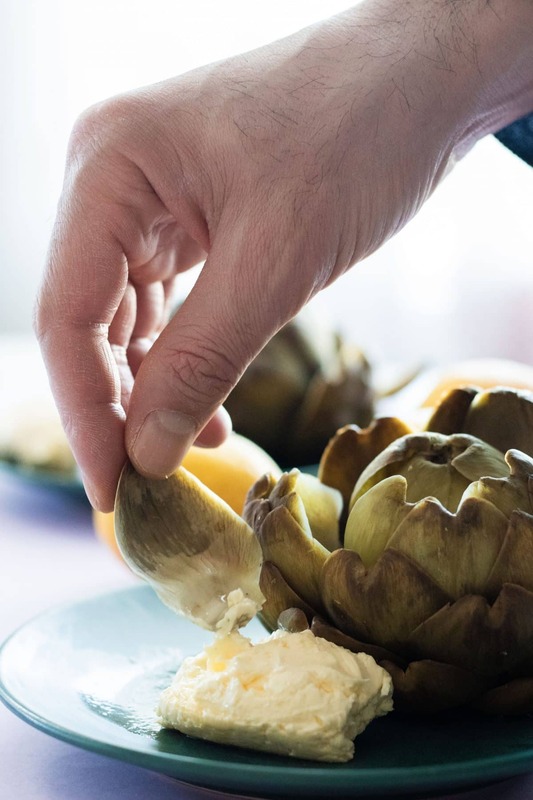 It might actually be just what your vegetarian dishes were missing – mushrooms move aside, artichoke is here to take over the vegetarian umami throne! Which quickly leads us into the big question: with all this addictive deliciousness, how often am I allowed to eat them? Can this deliciousness really be good for you? Artichokes are a true super food. They’ve actually been used for centuries in the Mediterranean area for their medicinal purposes. And I for one would not mind if my medicine tasted like this! One of the reasons artichokes are so good for you is that they’re low in fat and high in fiber. 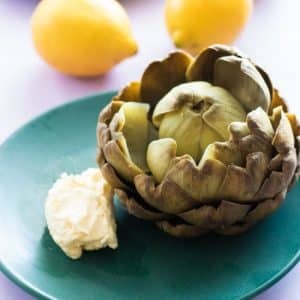 Giving your body fiber is a great way to stay full longer, and it’s probably the reason why artichokes are so filling. Because it sure isn’t the calorie count doing it – this comes in at just above 60 kcal per artichoke. Another great thing about artichokes is that they’re high in several important nutrients. Check out the table below for exact amounts for a medium-sized (128g) boiled artichoke (table adapted from Healthline). And as if this wasn’t enough – they’re also one of the best sources of antioxidants, and an alkaline “vegetable” (it’s actually a thistle!) which means you can use it to help regulate your body’s pH-level. Some other health benefits of artichokes include lowering blood pressure (especially if you have high blood pressure already!) and lowering blood sugar (great for diabetics! ), helping with indigestion and studies indicate that they may even help fight the growth of cancer cells. Artichokes like warm weather, and as such are best in the spring and summer months. And while you will be able to get artichokes any time of year it’s always nice to eat in season, isn’t it? Now in Sweden we don’t really have an “artichoke season”, as they’re not big fans of our climate. But we import them a lot, mainly from Spain or other Mediterranean countries. And the best & cheapest ones I find in the supermarket from early spring (they usually start getting cheaper around mid-March, and price is a great indicator of seasonality) and all through summer. You can often find good and cheap-ish as late as September even. For me, artichokes are so summer-related. I remember having them as a late night snack in our summer house, on those early summer nights when the sun just didn’t want to go down. So if you ask me? Artichoke season is in summer. Period. 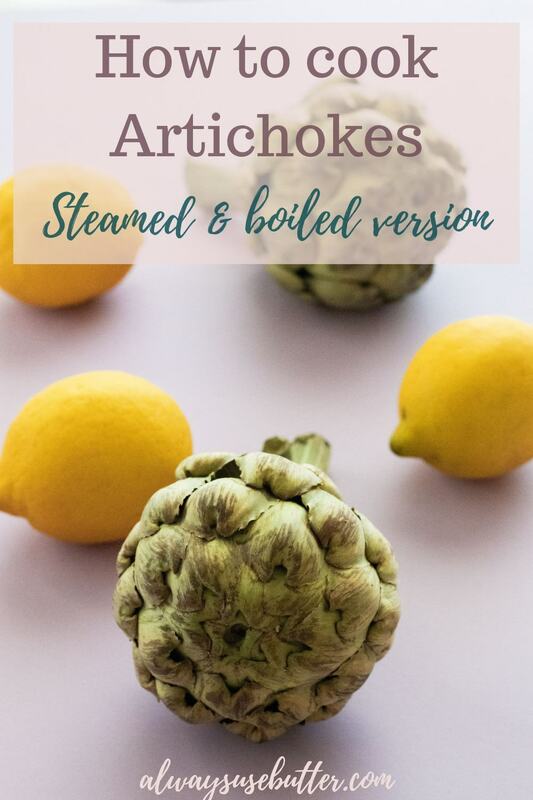 Artichokes can be cooked in many ways, and while having artichoke hearts on a pizza or in a salad or eating an Italian stuffed artichoke is delicious – my favorite way is to just have them boiled or steamed, all leaves and heart together. No matter the cooking method for artichokes, the best way to see if they’re done is to test. And by test, I mean pull on one of the leaves and see if it comes off. If it comes off easily, they’re done. If not, give them a few more minutes. How long your artichokes will take to cook depends on the cooking method as well as the size and freshness of the artichokes. Steaming will take a while longer than boiling them, and larger ones will take longer than smaller ones. 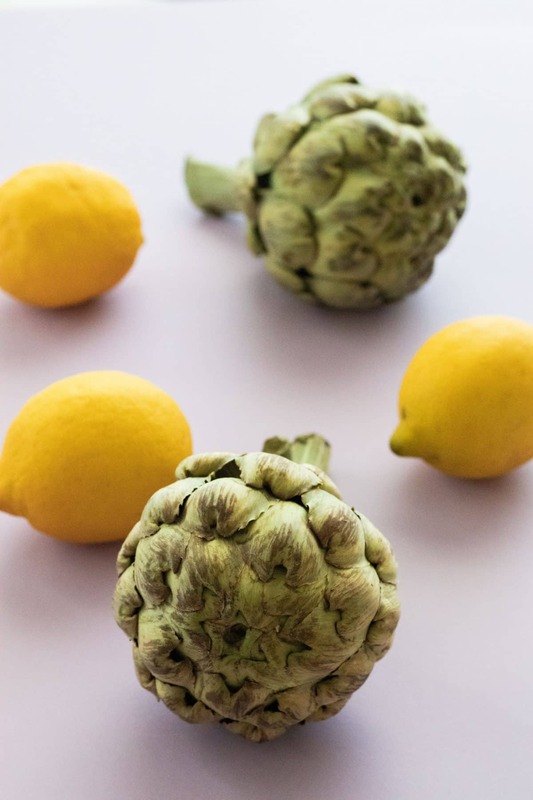 And in early spring when the artichokes are tender, they will cook so much faster than later in the season – we’re talking half the cooking time. So setting a specific time is difficult. Generally, I start with giving them 30 minutes – no matter the cooking method – and then check again every 10 minutes. It’s not the end of the world if you “over”-cook them – they’re not too sensitive to that. So if in doubt, give them a few more minutes. And keep in mind that sometimes, often in late summer or fall, they could take over an hour. 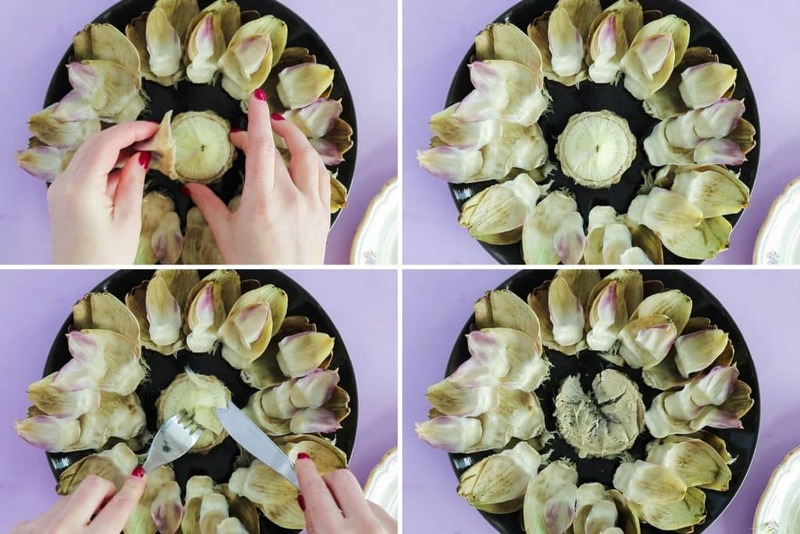 How to prep your artichokes will differ a bit depending on who you ask. I don’t do too much prep, to be honest. I just cut off the stem – as high up as is possible without removing any of the big leaves – and that’s it. I know many people cut the top as well, to remove the sharp edges of the leaves. Now I understand why you’d maybe want to do this in a fancy restaurant, but then again I really don’t. I love the look of the artichokes just like they are, and I’ve never had a problem with the sharp-ish (Come on! 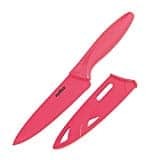 We’re not talking about a knife here!) leaves – not even as a child. So I leave it. But if you want to cut them, then by all means do so. 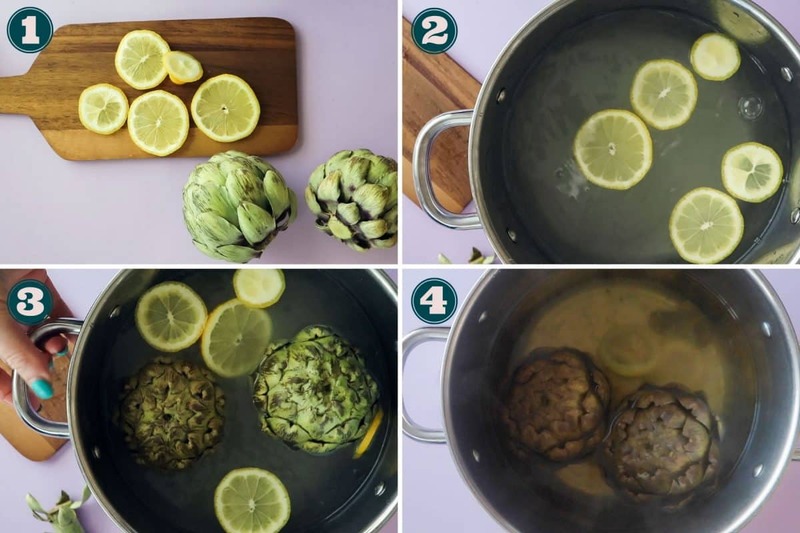 Boiling artichokes is super simple. All you need is a pot, water and salt. But if you want to (and I definitely think you should want to!) you can also add half a sliced lemon. Start by filling the pot with water – it should be enough to top the artichokes, or more – and then add lots of salt. Yep, we’re talking pasta water amounts of salt. So at least 1 tsp per half liter (that’s about 1 tsp per 2 cups for you non-metrics), and your artichokes will come out the yummiest. After the salt, add your lemon slices, and then your artichokes. Put on a lid and boil for 30-60 minutes (depending on size, time of year and freshness, as discussed above) until the leaves come off easily. I test once after 30 minutes, and then again every 10 minutes until they’re done. Once finished, place top down in a strainer (or on a plate, if you don’t have a strainer) to allow the excess water to drain, and then serve. Steaming artichokes is just about as simple as boiling them. And for this, you don’t even need salt! 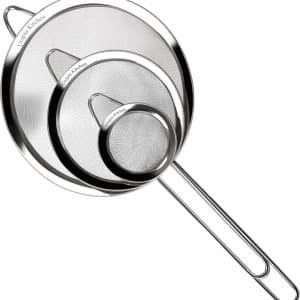 Instead – grab a metal strainer that fits over the pot. Once again start by filling your pot with water. This time, make sure it’s not all the way up to the strainer. 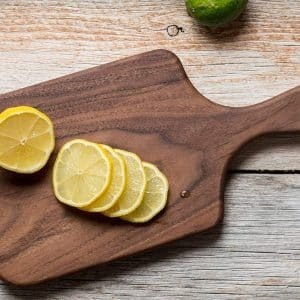 Place your strainer in the pot and put your lemon slices in the bottom of it. Then place your prepped artichokes on top. Put a lid on and cook for 40-75 minutes, until the leaves come off easily. Then take off the heat, and serve. 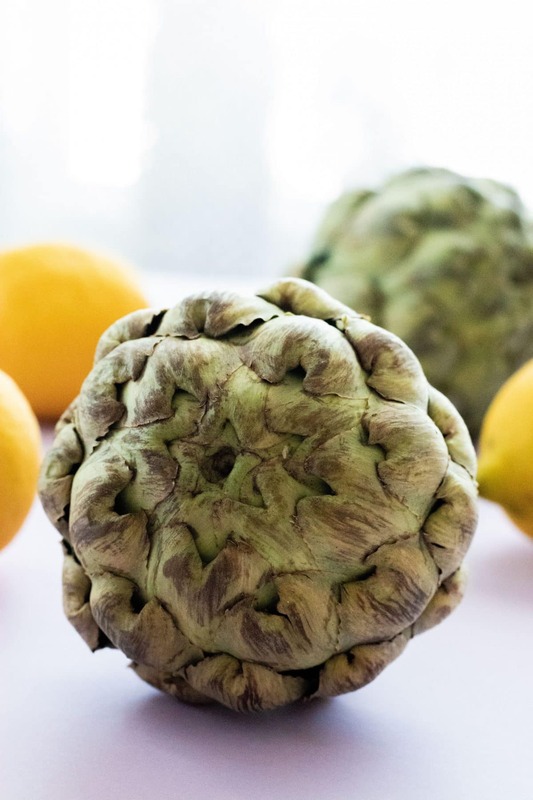 There are two very common ways to serve boiled or steamed artichokes, and one less common. And probably many more – but these are the ones I’ve come across. The first one is serving them with a simple vinaigrette. This is a nice way to take some of the edge off the richness of the artichoke, as the acidity of the vinaigrette will cut it. 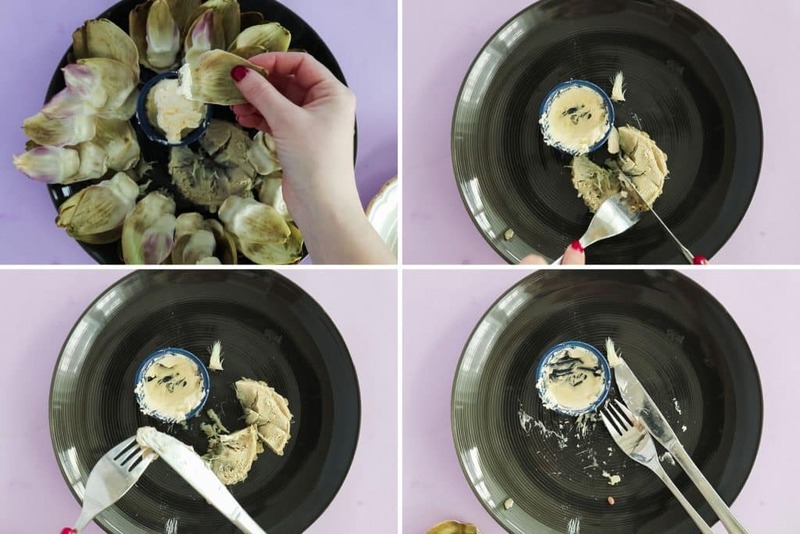 It’s also a delicious way to eat leftover cold artichokes. The second one is serving them with melted butter. This is so yummy, and was my favorite for a long time. But I also find it too rich, and I could never finish the whole artichoke in one sitting when eating it with plain melted butter. There just isn’t anything there to cut the richness. Now one option to cut the richness is to add lemon to you melted butter. Another, and my preferred method, is to step it up just a little bit more, and make some whipped lemon butter. 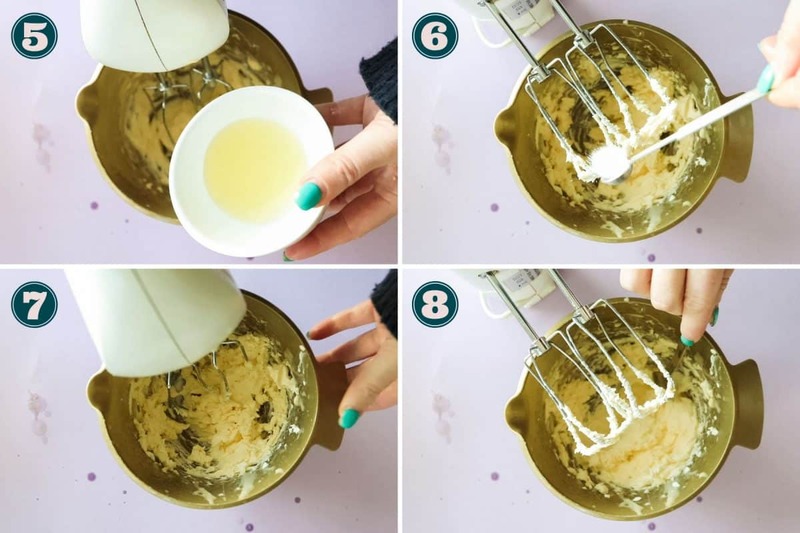 Whipped lemon butter is this delicious invention that’s the perfect combination of richness, fattiness and acidity – in layman’s terms this means you can eat even more butter before feeling full, because we added some lemon to it. It’s now my go-to for artichokes, as well as for many fish dishes. Now comes the fun part! As delicious as artichokes are, just as fun are they to eat. 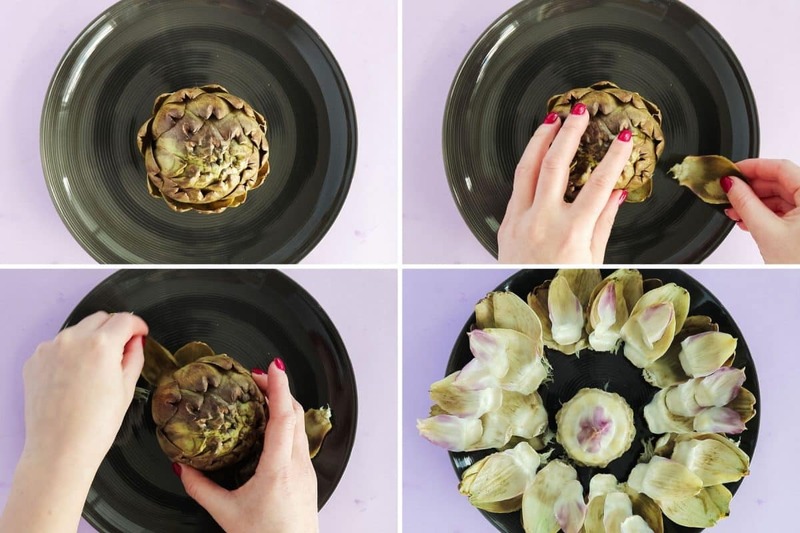 Eating artichokes is a game in two parts: the leaves & the heart. The leaves are the once you see, the ones you tested to see when it was finished, and the heart is what’s hiding underneath. So start by peeling off the leaves – one at a time, or peel them all off and then eat. Some even peel them all off before serving to their guests – but I’m far too lazy for this! Take a leaf and dip it into your butter or vinaigrette, then bite the edge of the leaf (the part that was connected to the rest of the artichoke) and pull off the meaty part. It’s not as hard as it sounds – I promise you’ll quickly get the hang of it! Once you’ve finished all the big leaves and come down to the smaller, thinner, white & pink leaves it’s time to find the heart. Do this by removing all the small leaves and you will uncover a hairy covering that looks a little bit like something you really shouldn’t eat. And no, you shouldn’t eat the hairy parts (although I don’t think it would hurt you in the least) – but what’s underneath, you most definitely should. So remove the hairy parts and underneath you will find the heart. Now the heart can be consumed as it is, just dipped in the butter, or you can save it and use it in salads or pasta. Either way – it’s yummy. Start by melting 1/3 of your butter and cutting the rest of your butter in small pieces. 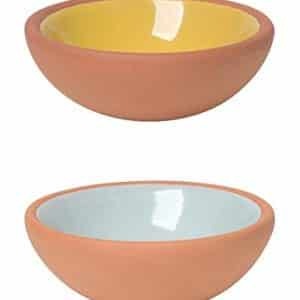 Place your melted butter in a bowl, preferably one with very high sides – this recipe is a splasher. 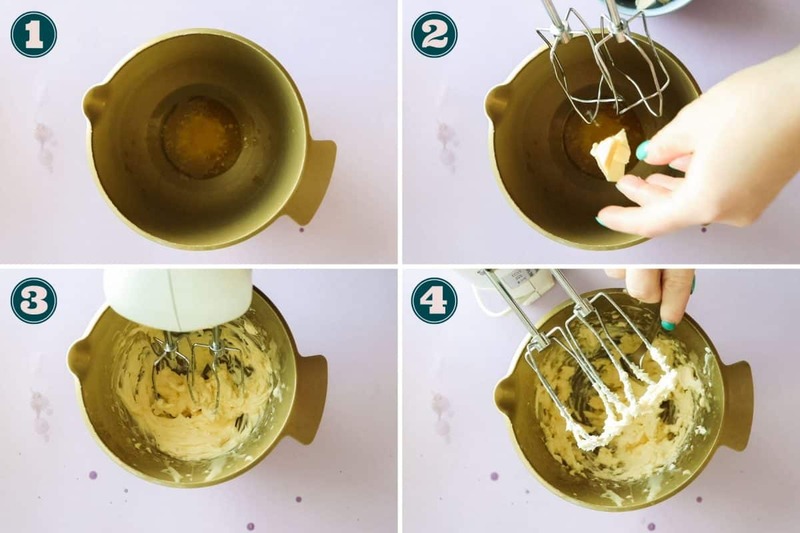 Add in a few pieces of the solid butter and mix well using an electric mixer, then add in a few more and continue doing this until all the butter has been added. After the butter has been added, pour in your lemon juice, taste test, and add salt according to taste. 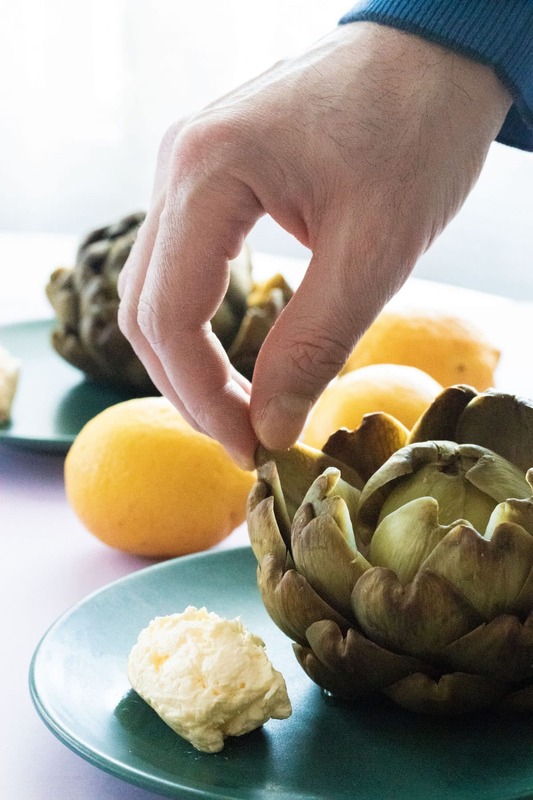 Serve the whipped lemon butter with your artichokes, and save any leftovers to put on top of bread or fish or anything else you can get away with. 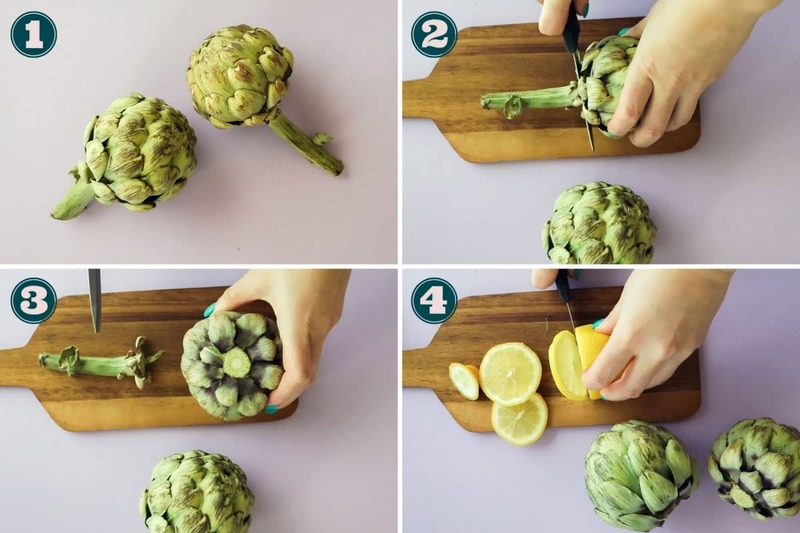 Now there’s really not much else I can do to get you to try out making artichokes at home. But just trust me on this – you do want to try it! As always – I’d love to know what you think about this recipe, so please leave me a comment below with any thoughts you have. And if you leave a review as well you will really make my day! Add water to a large pot, there should be enough water to at least cover the artichokes. Salt the water and add in the lemon slices and the artichokes. Cover and place over high heat. Boil for 30-60 minutes until the leaves come off easily. 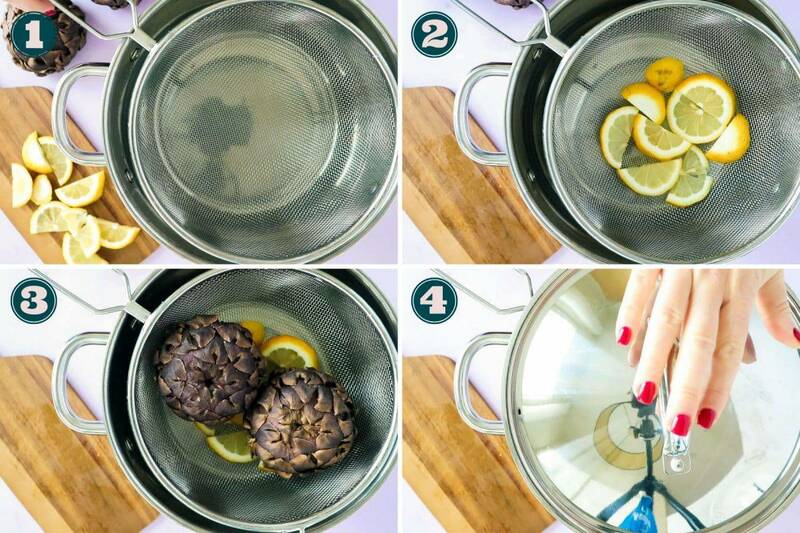 Take off the heat and place the artichokes upside-down in a strainer or on a plate, to remove excess water. Then serve with whipped lemon butter. 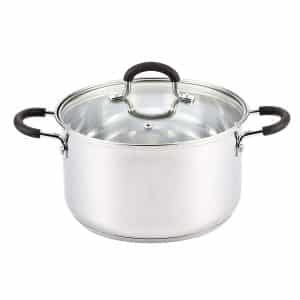 Bring out a large pot and a strainer that fits over it. Add water to the pot, making sure that the water does not quite reach the the strainer. 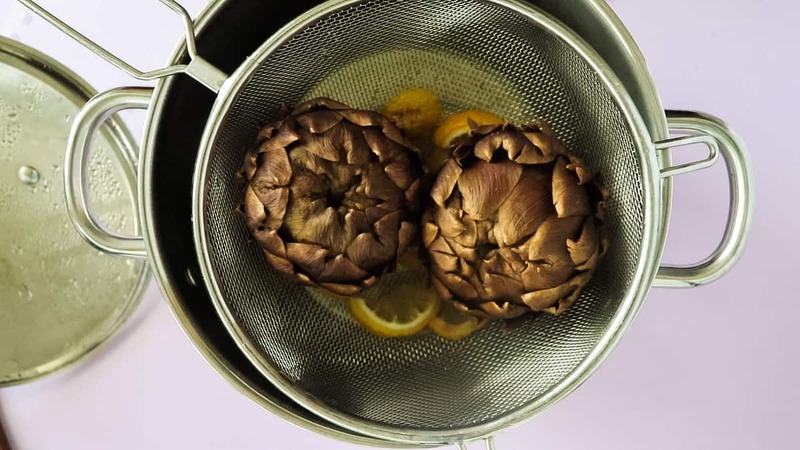 Add the lemon slices to the bottom of the strainer and place the artichokes on top. Cover and place over high heat. Steam for 40-75 minutes, until the leaves come off easily. Remove from the heat and serve with whipped lemon butter. Melt 1/3 of the butter and let cool slightly. Place the melted butter in a bowl, preferably one with high sides, and cut the remaining butter into small pieces. 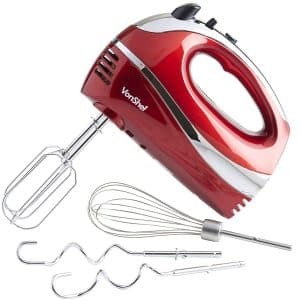 Add a few pieces at a time to the melted butter, while mixing well with an electric mixer. Once all butter has been added, mix in the lemon juice and taste test. Add salt according to taste and serve. Cooking time will differ a lot depending on the size of the artichokes and what time of year you are making them. Test them once after 30 minutes and then let them cook more if not ready – don’t be too afraid to overcook them they’re not so sensitive to that. I love artichokes and didn’t know they were that good for me. It’s a win-win!! This looks so tasty! I have never cooked artichoke at home, but you make it seem less intimidating than I expected. 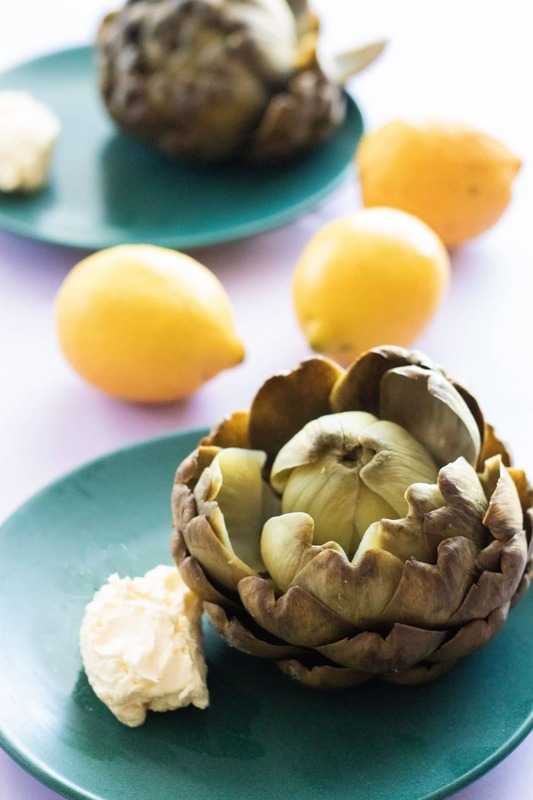 Artichokes are one of my favourites – so naturally, I knew I was going to adore this recipe. The whipped lemon butter takes this to the next level. Incredible! Thanks for the reminder! My mom used to serve these to us growing up with Hollandaise sauce and I had all but forgotten! Never had them with hollandaise sauce but that sounds amazing! Will have to try!